Currently my main focus for training is body language, and how it can increase your ability to influence. Even though most of our focus is on what we say, over 60% of our communication is nonverbal. In a 30 minute conversation two people can send over 800 nonverbal signals. Unlock your hidden super power by learning how to present yourself with body language consistent with your intentions, and improve your relationships with others. "I had a recent interview that I used several of his techniques. I could quickly tell the effect on the interviewer by just doing some simple things, and I'm excited to say I was given an incredible offer with a 15% bump in pay. " 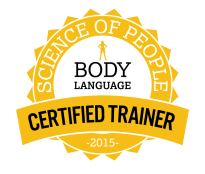 Certified through the ScienceOfPeople.com, we pull from a research database of over 2500 research studies, to find the most scientific and credible information on nonverbal communication. Of those studies, we focus on the most applicable and solution oriented. The result is tools you can use RIGHT NOW to improve your presence, charisma, power and more. "This has helped me to better listen and see what people are doing when they talk to me. You notice a lot more things then just what people are saying and more how they are saying and how they are reacting to other things being said in the room." ​Take this 5 minute quiz and see how your body language ranks!